Hello and Happy Monday to all. Have you recovered from the royal wedding weekend? Official photographs from Saturday’s wedding were released today by Kensington Palace. The three images were shot at Windsor Castle shortly after the Duke and Duchess of Sussex returned from their carriage ride. The pictures are all lovely remembrances of the day. For our purposes there is an added element to the images: we have a much clearer representation of the color of Kate’s Alexander McQueen coat. The color is clearly a very pale yellow in the new photograph, especially when contrasted against the white of Charlotte’s dress. But what a mystery it has been, and a challenge to sort out, at least for yours truly! On Saturday it appeared indistinguishable from the previously-worn McQueen, despite a news release from Kensington Palace that said the Duchess would be wearing “…a primrose yellow wool silk tailored coat by Alexander McQueen.” Some thought the contrast between the coat and the dress worn beneath it showed the color of the outer garment as yellow. On my monitor and iPad it just looked like a heavier, darker cream or ivory. 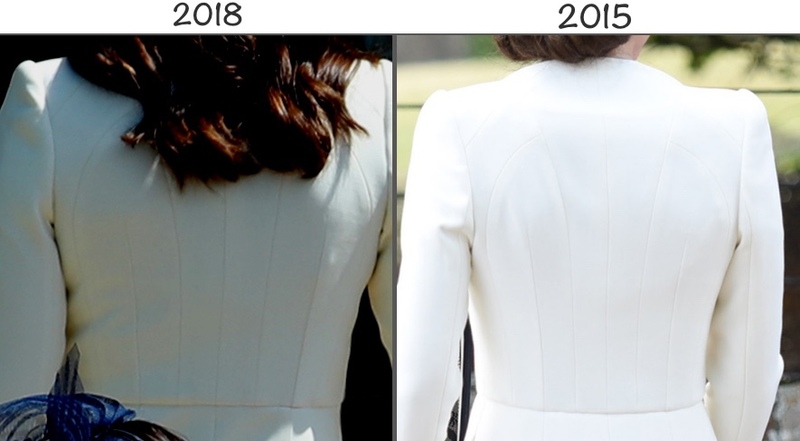 The seams on the back on the back and shoulders looked almost identical, but you can *just* see a small distinction: Kate’s new coat appeared to have a tiny bit more shoulder padding, puffing the shoulder up perhaps a 1/4″ more than the seam on the 2015 coat. As many have noted in comments here and on the Facebook page, the sleeves on the new piece had buttons. The fact there were buttons didn’t automatically mark this as a new garment in my mind; it is the additional fabric required to have the fabric overlap at the cuff that was a deciding factor. There would not have been enough fabric in the seams of the christening coat to have the overlap. (Apologies for not having a better photo showing that overlap, I will keep looking for one.) Of course the obvious question would then be: would Kate really go to the time and trouble, not to mention the expense, of having a garment altered just to add buttons? For her brother-in-law’s wedding? The other major factor: seeing what Kate wore Saturday side-by-side with her outfit at Charlotte’s christening in 2015. This should have alerted me that it had to be a new coat; there just wouldn’t have been enough fabric to accommodate the changes in Kate’s size and shape between 2015 and now. This one was really a puzzler. The input everyone shared in comments has been outstanding and very educational for me, it has really been a learning experience, particularly in the different perspectives on light colors at weddings. I think Kate did what she has done previously: she chose something that she thought would have the least distraction factor. Her penchant for having garments she is fond of made in multiples is well documented. Below, two Emilia Wickstead coat dresses. Two Amanda Wakeley frocks; there is a third color Kate purchased that we’ve not seen her wear. And two more Emilia Wickstead dresses. For full details on what Kate wore for the wedding, click here to see the original post. BTW, if the official photo had a familiar feel, it is with good reason. Two of the three pictures released today were taken in the Green Drawing Room at Windsor Castle. 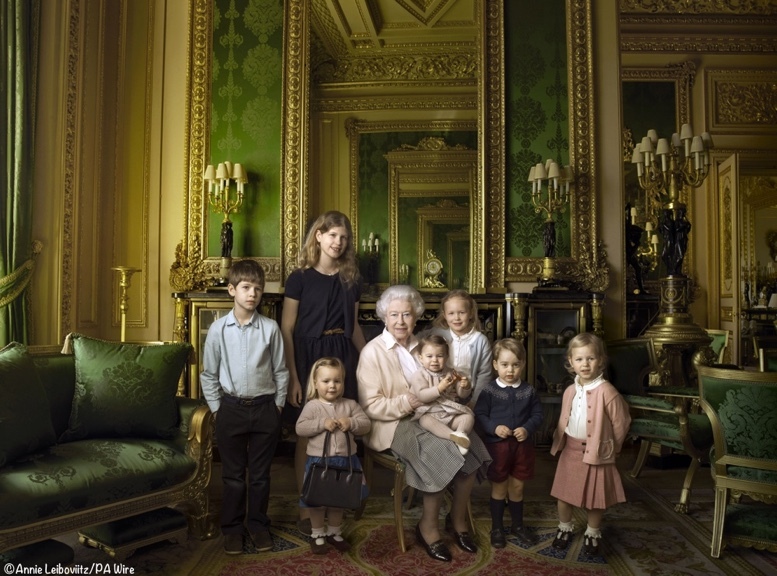 That is the same setting for the classic Annie Leibovitz image of the Queen with her five great-grandchildren and her two youngest grandchildren; that picture was taken to mark HM’s 90th birthday. There are a few tidbits from Saturday that didn’t make the post, or were added after most people had read the piece. This first image shows Kate’s former personal private secretary, Rebecca Deacon, and her husband, Gibraltarian football player Adam Priestley, as they arrived at St. George’s Chapel. This next item was added to Saturday’s post midday Sunday, I’m guessing many readers may not have seen the update. 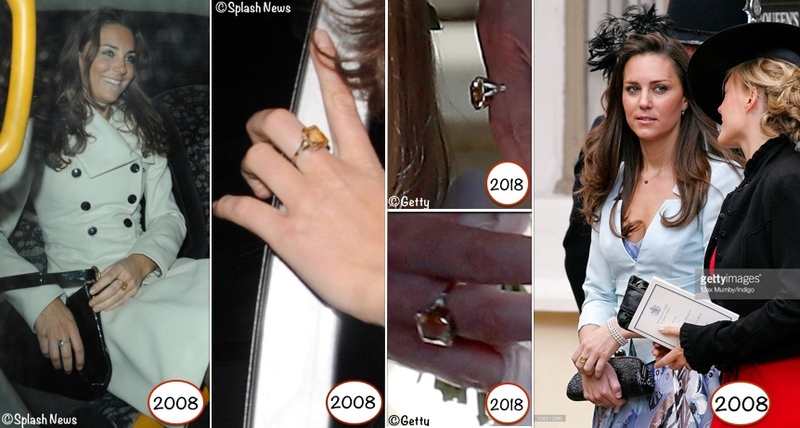 It involves the ring Kate was wearing on Saturday; it turns out the piece looks like a ring the Duchess has been seen wearing since at least 2008. Below left, Kate in January 2008 wearing what looks like the same ring; on the right, Kate appears to be wearing the same piece at the wedding of Lady Rose Windsor and George Gilman at The Queen’s Chapel, St. James’s Palace in July 2008. Thanks to Charlotte of the HRH Duchess Kate blog, she pointed out the January 2008 information, and also to Lorena for her comment on Saturday’s post, she shared links to images of Kate wearing the ring at the Windsor/Gilman wedding! 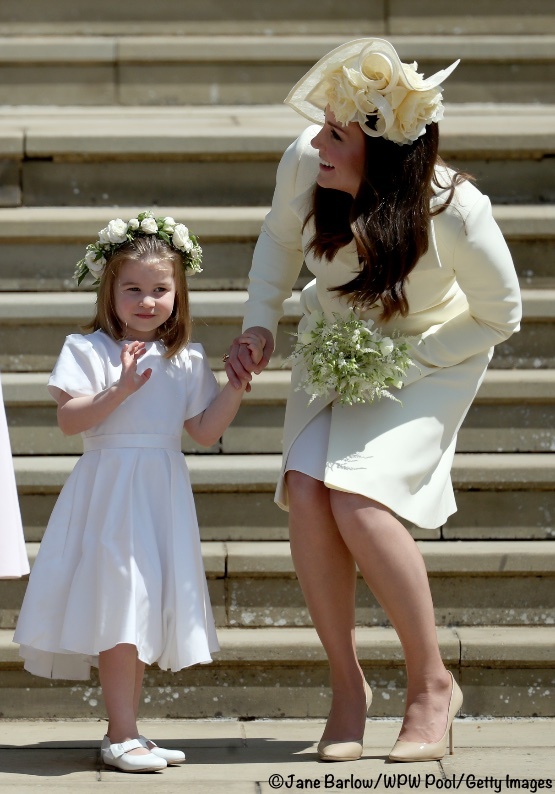 The final item is some cute photos of Princess Charlotte at Saturday’s wedding. I’m not licensed to use them on the What Kate’s Kids Wore site, but they’re too precious to leave unpublished. This one is proof positive the Princess hasn’t lost her touch when it comes to the royal wave. This gives us another glimpse of the “looking back over the shoulder wave,” much like what we saw at the Lindo Wing. And this final shot shows Charlotte gathering up her skirt as she climbs into the car to head home. On that happy note we will close, we’ll see you later in the week! 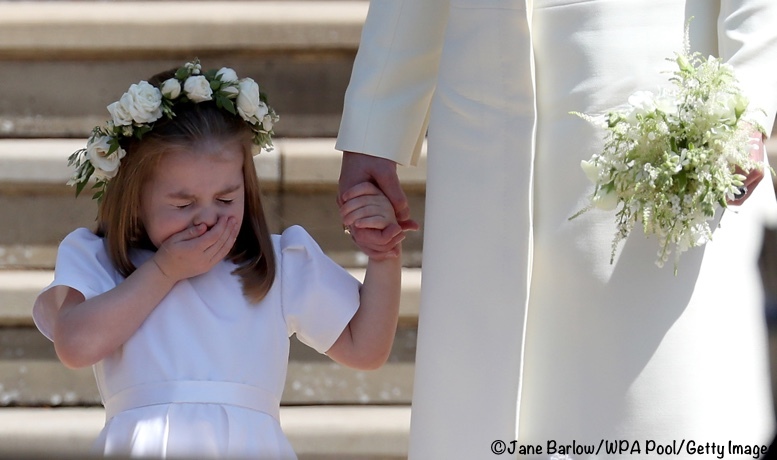 I didn’t read ALL the comments so not sure if this was mentioned; love love love that picture of Princess Charlotte sneezing AND COVERING HER MOUTH like a well brought up child should! Plus the picture of her getting in the car! Is she telling someone what they should be doing? or thanking them? or just telling them about the wedding and what she saw?! Whatever she is saying or doing she looks like a bunch of fun!! A new coat? An old coat? Who cares? I believe Kate looked beautiful and perfect! So much silly criticism is horrible! When Princess Anne got married for the first time, beautiful and glamorous Princess Grace of Monaco was lambasted because she wore a lovely cream dress to the wedding. Of course, then, the Internet and its useless trolls did not exist The Duchess of Cambridge is an exquisitely lovely woman who is doing a wonderful job and is destined to be a great Queen Consort next to her husband William. So agree JaneleeK! There was never any doubt it was a creamy pale yellow for the moment I saw her in the car with Princess Charlotte. I don’t understand the debate. On a side note, I have been to a wedding where the MOTHER OF THE BRIDE wore black and looked absolutely radiant. I have also seen many many bridesmaids in cream/off white and looked completely natural alongside a white bridal gown. In fact, Pippa’s bridesmaid dress was off white! What’s the big deal? Kate’s most recent outfit was an off the shoulder $40 dress. And it looked lovely too. I couldn’t imagine having to have my wardrobe choices picked apart. Kate does such a lovely job. Her choices are always thoughtful and modest. Not always my favourites or what I may have chosen to wear, but appropriate. Um, so we’re all useless trolls then? Lol. I see your point, but I’ll have to disagree. Like it was pointed out multiple times before, this blog is all about discussing Kate’s fashion choices. Of course she does a wonderful job, hence the very existence of the blog. But fashion is a language. It speaks not quieter than actual words, maybe that’s why it always fascinated the crowds. And this particular coat will stay a mystery to me for a long time, because I don’t understand its message. Perhpahs too much thought was brought into color coordination for the official group photo. There was never any “mystery” or “confusion” about what the Duchess was wearing. Every photo I saw showed the coat to be a light yellow. That’s why I never bother reading comments on this site. Everybody seems to see what they want to see and criticize the Duchess, relentlessly, no matter what she wears. It so tiresome. absolutely agree MSlewis, it is becoming very tiresome with all the criticisim. The coat was definately pale yellow and was completely evident from when she stepped out of the car. Let us stop shaming the poor girl for wearing something she obviously liked well enough to wear to this great event. On its own (apart from the debate about if this is a new garment or not) she looked amazing, and I certainly don’t think she committed a faux pas by wearing a light color – her dress is nowhere near bridal. I know what I looked like at my sister’s wedding and my brother in law’s wedding over a year after having my fourth so, yeah, she’s a rock star. But I do think it is bizarre to go to the trouble of having a garment made that is so so so so similar to a garment you have already worn to several very high profile events. It’s odd! One commenter said something like why not keep the overall shape and structure but add some details or “flair” to truly make it unique. To have a garment made that is just slightly different in color and detail for this momentous of an event is strange. It’s definitely a head scratcher. It will go down as a great Kate mystery in my book!!! But I’m confidant Meghan signed off on it so, in the end, it’s all good! I can’ believe I am writing this but if you closely look at the back view there is a slight blimp in the seam line in exactly the same spot of each of the supposed colours. That means it is the same garment. Lets stop writing and talking about it and move on. Move on to what? 😉 I am guessing that if we had new Kate appearances to talk about we would have moved on already. Since we don’t, we’re stuck here talking about the coat that was or wasn’t. I am guessing this conversation is going to continue till June 9, when let’s hope Kate appears at Trooping the Colour. I was going to write about that too and then saw your comments mentioning it! I think as far as the color, lighting can completely change everything! Yes it looks pale yellow in the Church but outside, it looks cream colored. The fact that she added buttons doesn’t even matter, I think! And sizing: she might’ve been a few weeks farther along post-partum when she wore this dress for Charlotte’s christening, but she still wasn’t back to her pre-partum size yet. The seam lines in the arm and shoulder on each side in each picture of her back are matching. Simply pressing the garment before she wore it this time could make it stand up a little bit more on her shoulder at the arm and shoulder seam line too. When she’s standing outside and especially comparing the two pictures, the color looks the same: cream! So just my opinion – but it’s the same dress worn before! Lastly, she purposely will rewear something at a wedding to not take any attention away from the bride, it’s been noted! I wish we knew what Kate wore to the reception later in the evening! Thank you for all the information you obtain for us. I still can’t get over Kate’s hat. I LOVE it. It’s in my all-time top 5 for her. FWIW, I assume it is either a new coat or a dyed old coat, I actually think she could easily have fit into her old coat at this point and it does fit differently. The sleeve buttons. who knows. But i will go with a new coat in pale yellow with a few tweaks, it is fun to try and figure out but in this case I think it is impossible to know if she reworked an older garment or had something new made. The most important part is that she was able to attend a full couple days of events and festivities, looked fantastic and got to spend it with family, kids and husband. I really up they have some down time soon. But I think the kids are not out of school for at least a month, so a bit more time before they head to the country, and Scotland with the Grandparents. Just a heads-up that your posts don’t seem to be picked up by feedly right now. (Hopefully it’s just a problem with my feedly.) Thanks for all of the coverage. I was just coming here to say the same thing! I figured something must be up when I didn’t see any posts about the wedding! Kate did wear the earlier version of this coat inside on her trip to Belgium and I think it remains looking much more white than this coat does when inside. What shoes is kate wearing? The Jimmy Choo Romy 100. You know I just sat and watched the entire wedding again…from the arrival cars with the Queen, the children and the bride, right through the ceremony and the carriage ride around Windsor afterwards. It was really such a glorious occasion! Kate appeared outside with the kids, inside sitting beside Camilla and then outside again at the end of the service. Each time Kate came on the screen I stopped the video to study her dress. In the outside sunshine and the inside muted light of the chapel, I can’t see a hint of yellow in her coat dress, only in the flowers on the hat. I do believe Susan when she says it is a different coat than worn on the other occasions, due to very subtle shoulder detail and buttons on the sleeves. But the dress still comes across as cream and I see it that way in the formal photos also. 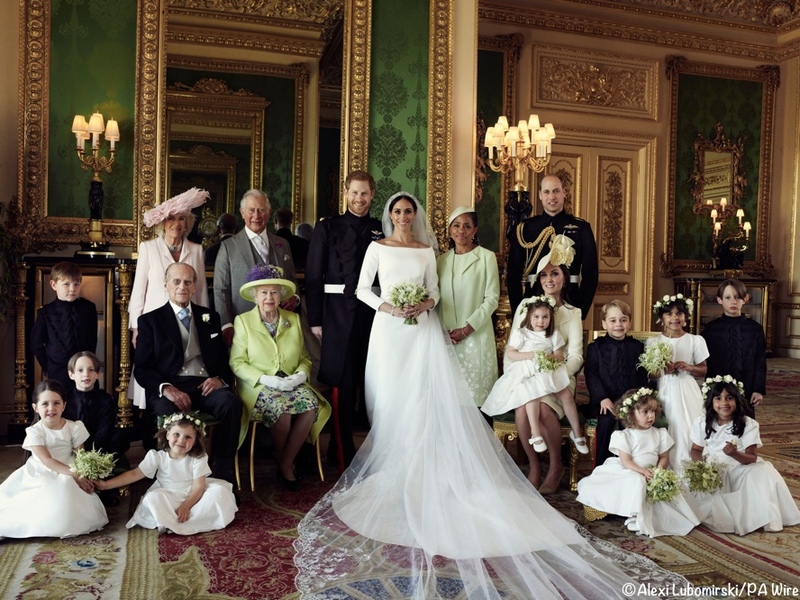 In the second row, across from the Royal Family, about seven people down from Doria, there is a woman in a yellow dress. It is not mustard like Amal Clooney’s but a soft yellow, not cream. Oh how we all wish Kate had worn this shade, so as to not cause the great ongoing coat debate. I have to say that I never thought this was the same coat. Although similar, they are not identical. Obviously, the color and size are different. There is no way she’d be fitting into that previous coat so well. I don’t think it’s much of a stretch to think that the ladies’ outfits were planned in advance to coordinate with each other and the room (is it only my family in which the mother and mother-in-law discuss what they were wearing to ceremony to avoid wearing the same thing or clashing or upstaging each other?). Beyond what the average family does for a wedding, consider for a minute how much care and attention you can see in the clothing planning for the royal tours (wearing clothes in a special color or with a floral design important to that country or made by a designer native to that country, etc., etc.) and we have already seen the way HRH loves to have the family be matchy-matchy on special occasions or for official photos (seriously, do you think it’s a coincidence that the prince’s uniform is black except for that gold braid and she is wearing pale yellow?). But, beyond that, if you look at the ladies, they are *all* wearing: pastel colored dresses + coats with pointed collars and simple closures in a length that falls at or just below the knee. The two matriarchs are in shades of green that coordinate both with the room and the greenery in the bouquets. Nobody else could wear green at that point, blue would have stood out too much from the rest of the scenery, the Duchess of Cornwall looks lovely in pink, but I don’t think pale yellow would have suited her and that left the Duchess of Cambridge with yellow which looks lovely on her (she could have worn pink, I suppose, but no woman wants to be thought to be imitating her MIL’s fashion). As for the design, well, given that the ladies were all wearing garments with the same design elements, and given HRH’s penchant for fit and flare designs with interesting seam detailing, I’m not surprised she ended up going with something very similar to a garment she already owned. I noticed the colour coordination, but you make a good point regarding even the design elements on everyone’s outfits. At first I actually thought the Duchess of Cornwall was the odd one out not matching the room, but then I saw the pink/red of the carpet and it totally came together. Beautiful, like living art. Great observations, and yes, most families think about these things, much less the Royals and the Queen. Thanks for sharing. 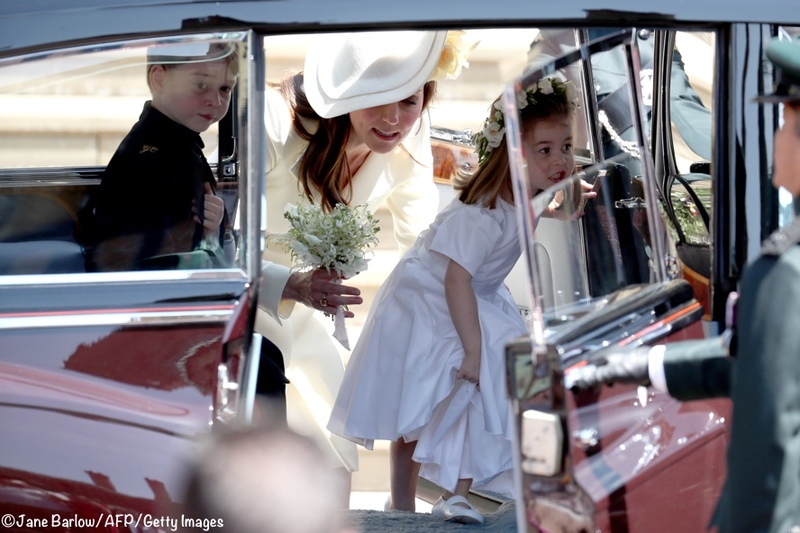 I’ve seen so many photos of the wedding and the Cambridge family at the wedding, but I hadn’t seen those last three photos of Charlotte sneezing and climbing into the car… adorable!! Well, I am convinced it is a new dress. but I agree with everyone about the issues she was dealing with as a “feeding” Mom. I would have had 3 pads stuffed in my undergarment:):) I am sure they had an additional Nanny at least for the day and they may have a hired baby nurse for at least the first 3 months. For the next year with both kids in school they may get by with a single Nanny and the rest of the help for pick ups from school etc.Three kids gets tricky especially if in different schools, the distance of Georges school will also get “real” for them this next year. We will see what they do over the next few years with schools and the kids and child help. Their lives are going to be very busy very quickly with royal activities. I agree also. Some reports had her looking bored, but I totally agree with your description of what was running through her head. Again, what a trooper! I loved her outfit and I’m agnostic on the colour. :) She looked wonderful and as usual seems to have chosen her outfit with care and consideration for the day. I am happy that DOC had a new garment made for her brother-in-law´s wedding. I think that is the correct thing. And then taking into account that she did not want to upstage the bride a coatdress is a good option. (upstaging Meghan wouldn´t be easy but Kate was sitting in the same part of the chapel and needed not to stand out). As she is one month after giving birth, her body is still changing so I completely understand re-using a pattern and style she loves (chose it for her daughter´s christening) and she nows fits her post-pregnancy body. So this seems as a good choice as the seemstresses could have probably prepare it and alter it at the last moment. Concerning the colour, first I think that photos are very misleading. Shame there isn´t anybody who saw her in real and could tell us 🙂 But as the queen and mother of the bride were in green, Camilla in pink, Dutchess of Essex in blue, there was not much choice left. Orange? forget it, Lilac? I don´t think that is a good colour for DOC and queen wore some with her lime. So yellow it is. I think that event the pale yellow works well for the DOC. Minor point, Sophie is the Countess of Essex, not a Duchess. Wessex, actually, but yes, she’s a countess not a duchess. Kate wore lavender/lilac very successfully in Germany – the dress rated highly in all polls. It may be though, she was thinking of the colours for the official photos in choosing what she did. Camilla in her pink seems the odd person out. I wonder if she had originally intended to wear the green Wedgwood type Oldfield coat she wore to the garden party – and then found out Doria was to wear green – who knows. She’s less than 4 weeks post-partum. She is likely solely responsible for breast-feeding a newborn that eats, spits up, and poops constantly. When I was last in a wedding with a newborn to care for, I was “Topping her off” and adjusting breast pads less than 10 minutes before showtime. I was just thankful to have made it down the aisle before the bride. So I’m going to go with the theory that Louis spit up on the primrose yellow, but having thought about that possibility, Kate brought this dress as a backup. Or that in the chaos to get George or Charlotte ready for the car ride, some little hands smudged her dress. Bottom line-who cares. Stuff happens. And She looked amazing for a mom of a newborn and 2 preschoolers—even if she had help. Speaking of which. SuperNanny and grandma Carol were at the wedding. So who was taking care of Louis? Ha ha, this is EXACTLY what I was thinking! She’s exhausted from the recent birth of her third child and I imagine that morning she was dressed and ready to go but Prince Louis was fussing and she is first and foremost a mother, so she picked him up to soothe him but he either pooped or spit up on her dress! I then imagine her call to Meghan, almost in tears. She mentions she has a similar dress she for Louis’ christening, it’s a dress pattern Meghan would recognize but it’s not quite the yellow she planned to wear. It’s more of a creamy yellow. Kate can still wear the yellow hat and her yellow jewelry, is that okay? Meghan, having weathered a stormier sea than this, assured her new sister in law that it would be fine. Just come and celebrate the union, sit for the pictures, and then you can go home to baby Louis. That’s how I imagine the morning went. I would imagine if Kate had called anyone, she would have called the Queen. However, this coat/dress may have been planned all along, and her support staff is certainly knowledgeable enough to have similar backups ready for such an occasion. The bright sunlight of the outdoor photography at that unusual time (Kate and William’s took place much earlier in the day) would have washed out most pale colors, and a more intense shade of yellow would have photographed awkwardly. Kate would have drawn too much attention to herself and would have been criticized for that. Indoors, as the picture at the top shows, the coat is definitely a soft yellow. She did well and she looks gorgeous. And you’re right– she probably could not wait to get home to Louis! Doesnt make sense that someone with a billion dollar closet would pull an old dress off the rack right before going on to world stage. But maybe baby Louis spit up on her 😀 Still not sure if i agree its new or old. Definitely disappointing. She could have chosen any understated design. Why reuse a design that she already wore to a well publicized event, and rewore many times again ? These are all excuses and don’t make sense unless the Princess had another outfit and something happened last minute. That is my guess! It is interesting to note that Oprah Winfrey almost made the same fashion “mistake” as the DOC, but her “handlers” realized this would be an issue at the eleventh hour and, as a result, had a new dress made for and delivered to Oprah in less than 24 hours by Stella McCarthy. Too bad the DOC’s “handlers” couldn’t foresee this issue of how clothes can photograph lighter than they are. I believe the poor DOC was trying to stay under the radar by cleverly choosing a dress coat in an almost identical cut to her whiter one but ended up becoming a point of controversy as the audience saw her wearing white and not the actual primrose yellow color it was. See the article in Oprah at http://time.com/5285402/oprah-royal-wedding-dress/. There’s no rule about wearing cream that I know of – I should imagine Kate was surprised how controversial it proved – if indeed she thought she was wearing cream and not primrose. I don’t know where this ‘don’t wear cream’ idea came from. People often do. *Another* “Great Kate Coat Debate”! Well, just to make myself sound like a broken record… I love this pale, buttery shade of yellow and ADORE that hat. I think she tried (and in my opinion achieved) showing proper respect for the occasion by wearing something new, but also kept herself low key by making it similar to something she already owned. I think it was also a style she knew she would feel comfortable and confident in just a few weeks post baby. And The colors of everyone in the family photos blended wonderfully. And great detective work to all involved. I’m in the “she dyed the dress” camp! Shoulder pads and buttons could have been added later on to improve fit and make it easier for her to wear. It makes me think of the outfit Donna Air wore to Pippa’s wedding. The same delicate shade,but It’s a different material and that’s why it’s visible it is yellow. I love that the women’s outfits form an “English spring bouquet” of colors. It’s just lovely. 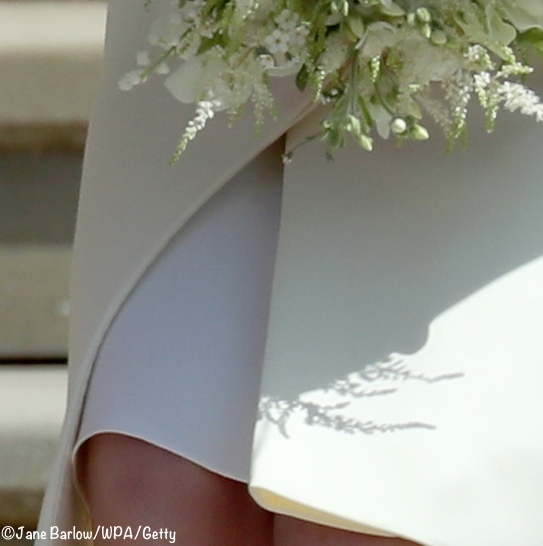 I’m curious …in both royal weddings and Pippa’s, the bride’s had small bouquets and flowers that were mostly white. In America, wedding “colors” are such a big thing with everything from the usually larger bouquet to the bridesmaids’ dresses to the décor reflecting those colors which can be bright. Is it an English thing to have wedding “colors” mostly white and bouquets small? I think the primrose yellow is a lovely choice and her hat is wonderful. She looked beautiful and it is amazing she gave birth three and a half weeks ago. I kept thinking about little Louis and if she had to dash out after the wedding to feed him. Hmmm…most of the bride bouquets I have seen are pale flowers. Proud Yankee here. I feel like I need to make a comment as well. Kate obviously 3 weeks postpartum is not fitting into the dress she wore for Charlotte’s christening. When you look at her you can most definitely still see the baby weight on her (this is not a criticism in anyway). My guess is she and Sarah Burton decided on a style that would flatter Kate, but that they didn’t have to put in the time creating a new design when Kate is a little busy and one she obviously felt comfortable in. The pattern was already on file for Kate and they would just need to take new measurements. Yes the colour could have been a smidge darker, but I personally don’t think it is a big deal. Unless she went for a Monster-in-Law effect ( https://www.popsugar.com/entertainment/photo-gallery/22506625/image/22590512/Monster–Law ) there was no detracting from Meghan. If she would have gone too dark (aka Amal Clooney) she would have clashed quite badly with the other people in the official photos as well as the green room in Windsor Castle. Any way that is my two cents and whether she had been wearing a the repeat or new dress she still look appropriate and amazing. Thank you for those extra photos of Charlotte. She is surely a superstar in the making! thank you for the detective work on the coat. I think Kate got new citrine earrings following Louis’s birth and wanted to wear pale yellow to compliment – called McQ and asked for an update on her christening coat (a little more generous cut for her little mummy tummy and this was an easy solution. they sent over fabric swatches, that was their sample… may have looked a little more yellow in the original swatch – Im sure she KP was surprised as well. She looked lovely per usual. Moving on from the great coat debate… lets talk about the Citrine Ring… I wonder if it belongs to Carole Middleton. I could see in her younger years raiding mom’s jewelry box for nights on the town. And now with her new Citrine earrings, calling mom and asking to borrow again. completely something I would do. Maybe the ring was a gift from her parents for college graduation or a birthday. What a scoop! Congratulations are in order for a magnificent team effort to clear up the wedding coat mystery. I’d clean forgotten about the other repeats, especially the Wickstead coat, somehow the repeat doesn’t seem so obvious in that case. 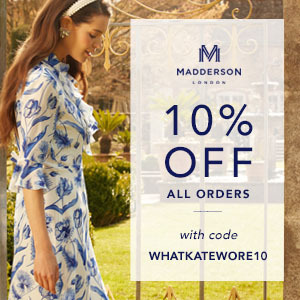 I loved the Wakeley in whatever colourway but I never really liked the Wickstead dress, it looked juvenile to me in either shade. About this special new coat though.. I wonder will we see it again but with a different hat and accesories for the christening of Prince Louis? Since she is like the rest of us and isnt afraid to shop her closet. Thank you WKW and WMW for all your research and bringing us these sites to follow and ‘community’ to be a part of! Yay, mystery solved! Kudos to you for figuring it out. I agree, the button placket on the sleeve pretty much clinches it. Don’t we all wish that coat had been just a *skotch* deeper yellow, for a variety of reasons–to better match that hat, to distinguish the color from white, to make it different enough from the christening dress so that it a) read as a new garment, and b) avoided all this confusion! That said, I liked the look even when I thought it was a rewear, and now that I realize it’s a) new, and b) yellow, I like it even better. I agree. I am happy to finally know that it is perhaps primrose yellow and a new outfit. 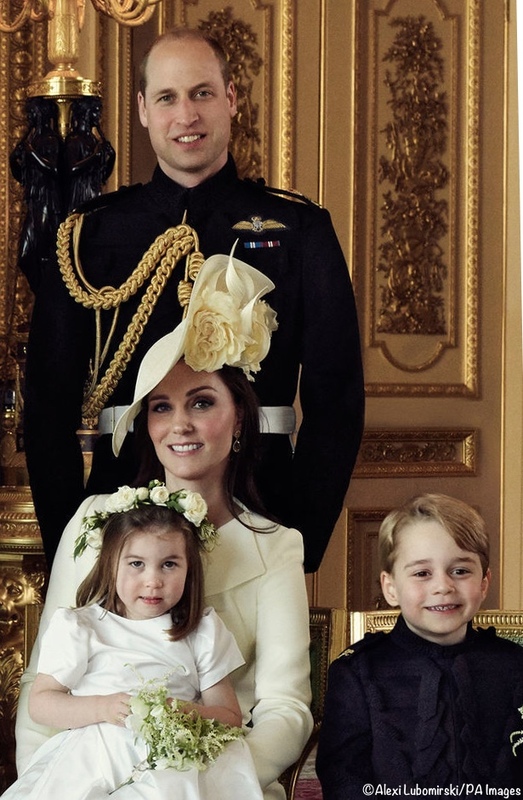 LOVE (a million times ) the official wedding photos with a happy Prince George and charming Princess Charlotte….oh she is a charmer! Well, I guess the overlap with buttons on the sleeves and the slight difference in shoulder padding are proof that this was a new and different coat dress. But my on my, did it fool people. Around the world, fashion experts, commentators, social media, our own Susan and most of us on WKW were convinced this was a repeat garment worn three times previously. It is a shame that this even happened, because it certainly did detract from how stunning Kate looked. And the “is it appropriate to wear white/cream to a wedding” controversy caused a great divide. I put some of the fault with the Alexander McQueen Fashion House. Kate is certainly one of their most famous clients and such an ambassador for their business. Surely someone at McQueen should have clued in, that this item was almost identical to one they’d previously created. They should have realized a few changes were needed. Even if Kate requested the same style as the previous coat dress, subtle differences should have been incorporated. The colour could have been a bit deeper, to match the flowers on her beautiful hat. The lapels could have had a slight variation, there could have been a bit of appliqué, cuffs on the sleeves, any number of small details to distinguish this dress coat from the one worn several times before. But let’s now move on. This may be the last time we see Kate for awhile. Harry and Meghan’s wedding was beautiful, as is our lovely Duchess of Cambridge. I believe it was intentionally misleading. It would be Kate’s way of keeping interest off her and her outfit. Oh my, the visuals. I am snorting, lol. YES that was a great comment! Kates outfit has caused much debate chez nous. Joan and Britt Girl, I have to agree, I think it is the same coat with buttons added. Why create a brand new coat in exactly the same style in such and indistinguishably similar colour? When Kate has had duplicates made of her outfits it seems that they are always in very different colours. Also the colour of her outfit is too close to white which should be reserved for the bride should she choose to wear it…. I confess I was surprised and disappointed when I saw Kates outfit, as, as with many other readers, I automatically felt that she hadnt made an effort for the wedding and that she wouldnt have worn what appeared to be a four times already worn outfit to her sisters wedding. The DoC could have gone pale pink like Camilla for the photos and looked amazing. That being said she did look lovely as always when she wears McQueen. I cant see the Royal household releasing a statement on the topic, tho it would be fab to maybe hear from an insider eg. the DoS s best friend Jessica Mulroney, who may know the insider goss. LOL. As long as the bride (who looked so beautiful, classy and elegant) is fine with it, thats really the main thing when it comes to such sartorial details :0). Dress details aside, may Harry and Meghan have a long and happy marriage and may they make the world a better place because of their union. I will never acknowledge that coat as yellow. It’s off white or cream… in fact it looks like the same color cream that used to be the color on the walls of my old apartment! The walls had a yellowish tint to it depending on the lighting but I can assure you the walls were not primrose yellow! Haha. Overall she didn’t really distract from the bride because the camera was on Meghan and she was the one we cared about on Saturday. However we know Kate has a zillion outfits she could have chosen from. Girlfriend just had to go and pick an outfit that straddled the edge of “pale yellow” and white! If it was a different McQueen coat, it was kind of a waste to get two coats in very similar colors. Oh well, we will have to agree to disagree. I wasn’t a fan of this choice of outfit, I know a lot of people like it. Oh my, could the cream versus primrose yellow debate be the new Yanny/Laurel?? 😂 In all seriousness, I think to some people the coat will look cream and vice versatile! Either way, she looked beautiful and as always so elegant. She just had an almost perfect eye when it comes to looking so put together! I agree with another post that her hair looks great styled like it was today. 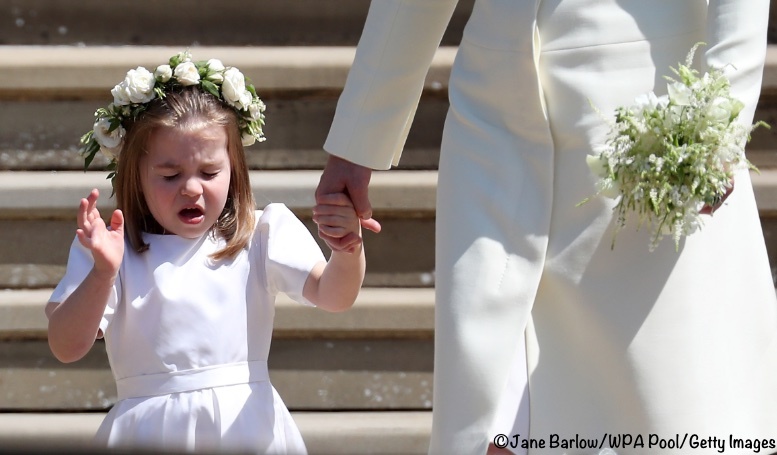 And finally, Princess Charlotte is beyond adorable and simply hilarious!! Clearly someone is going through some etiquette training with Charlotte (and I would imagine George as well). As a mom of my own three year old, it just makes me wonder if Kate is doing all that heavy lifting, or if she has someone outside help with Charlotte when it comes to public mannerisms. I’ve wondered that too–whether it’s planned training and if so how much, or if at this point it’s been limited to a simple, “people are coming to see us, so be sure to wave to them.” Even if just the latter she has clearly taken to it! Your detective work has raised an even bigger puzzle for me – why would anyone have two dresses made that are so similar it takes 2 days to decide they are different, and even then, many are not convinced? As you point out in the post, we have seen the DoC have multiple copies of a dress made – but always in distinctly different colours, therefore presenting the wearer with two different options. I love that she re-wears dresses, and I’ve long been a fan of the cream colour version of this dress, but for me, this “new” dress is just a waste of money! I have been following this blog since 2011. I am absolutely amazed by the quality and quantity of information and images published. The latter “detective work” is also incredible. I think I am not supposed to solve this “old coat or new coat” problem. However, let me add a short comment. Let’s suppose, this coat is the old one, worn at Princes Charlotte’s Christening for the first time. In this case, the Duchess had shown us, how accessories might change the whole outfit, even its colour. The hat is clearly pale yellow, her earrings are yellow, as well. Immediately, the colour of the coat seems pale yellow for many people. Don’t forget about her knowledge in art, which helps her to make such “wonders”. Thank you again for the wonderful posts. I hate beating a dead horse, however, I still am bemused by this topic. If I had to describe the color of her dress as seen in the photos accompanying this post I would most definitely describe it as pale yellow but could accept someone else’s description of “cream’. Still, the color that came across on my television monitor was, most decidedly, yellow. Your post is my thoughts exactly! On my screen, her dress is pale yellow, certainly not off white or cream – so i was also bemused as to the great colour debate, when to be it clearly looked so much more yellow than the other one! Thank you for the post and the close-ups. I find it rather bizarre that Kate would insist so much on not distacting the attention away from the bride. Clearly, all eyes were on Meghan, and she was the absolute star of the day, from he amazing dress to the grace with which she held herself. Seeing Kate’s (I was so hoping for new and stunning) outfit was my second highlight of the beautiful ceremony. I enjoyed the guests’ arrival and many were dressed stunningly. Take Pippa. I’m not a fan of hers, but her look was exatctly what I hoped from Kate: new, pretty, elegant, charming. Did it distract anyone from Meghan and her Givenchy? Of course not. So, this excuse is getting old, especially considering how enraptured the crowds are wtih Meghan. Oh, yes, I forgot Kitty. Her dress is my favorite along with Amal’s. She looked gobsmackingly stunning in that green! A great blog! If you look closely @ the green chairs they are sitting on they are the ones from Harry’s chrisening. I can only echo what others have written: many many thanks for such tireless researching of what Kate wore! Wow ‘Sherlock’ Susan, that’s some detective work! I can envisage you pouring over photos with your magnifying glass! Informative post as ever. What I really love be from the group photo published yesterday is how all the principal guests, the Queen, DoC, and Meghan’s Mum all co-ordinate in the photo with the flowers and the room, it’s beautiful – even Camilla’s outfit blends and harmonises. The released photographs do suggest collaboration on colours between the ladies and the result is a timeless, elegant photograph. The suggestions that Kate chose an inappropriate colour seem to show a cultural difference. For an English wedding, its not inappropriate to wear pale colours which I am assuming from comments must be very in other countries. It shows the minefield royal ladies face trying to get dressed without causing offence. Kate is not the type of person to dress inappropriately, I think she considers things very carefully. Can I also add how fabulous Doria Markle looked; from start to finish she was a very elegant lady and fits beautifully into the photograph. I don’t think many of us could step up to the mark quite so well. The family wedding portrait is wonderful. I loved all of the wedding photos released, especially the black and white picture of Harry and Meghan. I’ve stopped worrying about Kate’s dress – I’m so in love with her hat! I don’t think she’s ever had a prettier one. She was lovely and supportive, just as we’ve come to expect. It was great seeing the royal family all pull together to make this wedding day special. Everyone did their part. I thought that Charles stood out as going the extra mile for Harry and his bride – in showing consideration for Meghan’s mother at the ceremony, giving a touching speech at the Queen’s luncheon, and throwing what was apparently a great evening reception. And William was the ideal best man-best brother. Very touching to see. I cant believe the fuss that is being made over Kate’s outfit. Two things: one, its clearly a different coat – the collar, shoulders, arms and seaming are different, if similar. Two, its clearly the ethereal pale yellow of the wild primroses that cover the meadowsin esp southern England in the spring. Perhaps people are confused by searching primrose yellow and coming up with some saturated deep yellow dreamed up by some American paint company. The centre of those wild primroses are a deeper shade of yellow echoed in Kate’s hat. 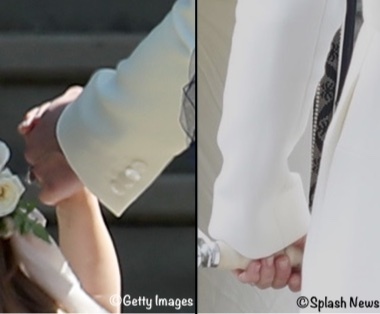 The pale yellow colour is clearly shown in the BBC frame grab of Camellia and Kate at the service and by the photo of her crouching with Charlotte where the white of the flower girls outfits are contrasted with the pale yellow coat Do people really think the Palace lied when they announced it was a new outfit? Conspiracy theorists run amok. And if people think all these outfits weren’t carefully coordinated in colour and look, they don’t know anything about how royal events are stage managed. The wedding picture makes that clear. Lastly I’m not clear why there is so much pearl clutching over wearing cream (even if it was cream rather than pale yellow) to a wedding where the bride is a divorcee but wearing a full veil with a 16 foot train and a pure white wedding dress. I thought Kate’s outfit was not only entirely appropriate but she looked absolutely gorgeous. I especially love what you said about paint companies and people googling a color to determine whether something is accurately described as that color. Hilarious and oh so true! I’ll have to kindly disagree. To me, it’s not a question of any conspiracy theories. If they say the dress is new, so be it. But the smiliarity of the design left confused many people, and it was largely commented on TV that the outfit was worn three times before, so the difference wasn’t obvious at a glance. The color in itself doesn’t bother me. I don’t like that it looks so misleadingly like a repeat. It’s true that the colors are very beautifully coordinated on the group photo. But it’s one picture, and more people followed the ceremony live than those who’d seen the photo. I don’t doubt that a lot of consideration went in this outfit, but as it happened in the past, it’s still a miss to me. All Kate had to do was wear a slightly more attractive dress, obviously new to those who follow her fashion choices and of a slightly darker yellow shade. Also, there is something else that needs to be considered. It has only been a little more than a month since the Duchess gave birth to her third child. Even for someone who is as fit as she, the bouncing back to regain one’s pre-pregnancy shape (not even considering here one’s pre-pregnancy weight) after one’s third child is a work in progress. I can well remember that each post pregnancy was different. I was skinnier than I had eve been after the birth of my second child – walking out of the hospital in a dress that accentuated my very flat stomach – and still looked quite rounded two months later (though back to my pre-pregnancy weight after the birth of my third child. Also, I can remember that in the first two to three months after the births of each of my three sons, my shape seemed to fluctuate even after losing not only the pregnancy weight but a little more as well (for the record I was slim). With my daughter my shape remained the same. My guess is that she decided to have a dress made in a very similar style to what she had worn on previous immediate post-pregnancy occasions figuring that adjustments could be made quickly so that the dress would have a fitted look for the occasion. I realize that she has help but I have to say, my hat is off to her to be so cheerful, patient, and beautifully attired. What a role model for any young mother. Actually, the one who made an iffy etiquette choice was the bride herself – second times brides usually don’t dress like they were a first time bride – certainly not with a face veil. That was extremely surprising. It was not a choice I would have made. I looked up colours for guests in Debrett’s and to my surprise it does recommend against wearing cream or white – I had never heard that and have been to many weddings where guests wore cream and never thought about it – as long as the look wasn’t too ‘bridal’. Here, here, great remark (about everyone quibbling over Kate, when we ignore Meghan’s choices, as a divorcee), but I’m more than middle-aged, where things like that matter! What detective work! I’m relieved to think that you’re right, that this is a new garment after all. I think she probably was chagrined to see that this photographed a bit more lightly than she expected, but who hasn’t had an unexpected snafu with a planned outfit, and especially when they have a tiny baby at home to occupy their thoughts? I was quite put off to think she’d shown up in a repeated cream outfit, so really, I’m so happy you (and some helpers) put the thought and time into cracking the mystery! Her penchant for purchasing the same dress in multiple colors is very understandable. I’m sure all of us do that sometimes, so it’s lovely to see someone with so many resources relying on that strategy too. This is not quite a Kate comment, but still interesting when it comes to fashion. 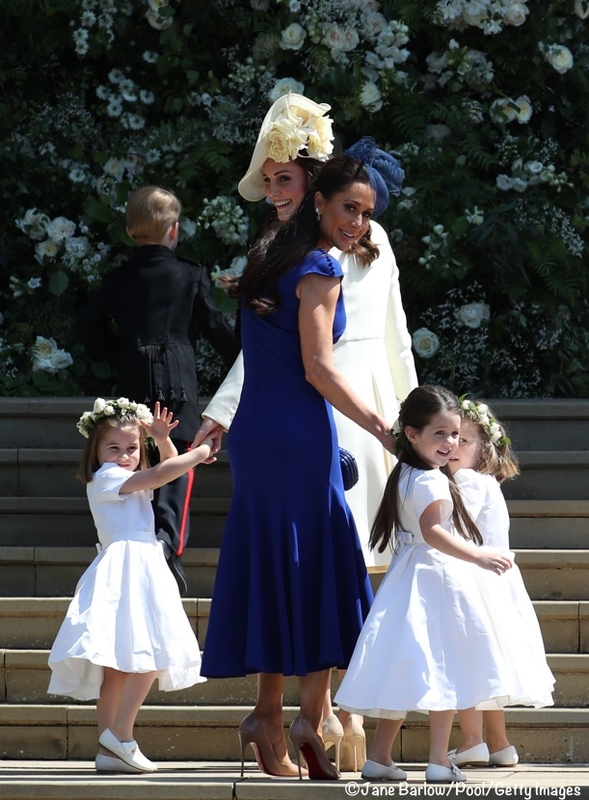 As many saw the Middleton family where invited to the royal wedding on Saturday. As always Carole and Pippa looked classic and elegant. I noticed right away that Carole was wearing a Catherine Walker coat and a custom designed Jane Taylor hat, but the most interesting extra note about it is she wore Catherine Walker to Kate’s wedding at Westminster Abbey in 2011, to Pippa’s wedding last year, and now to Meghan’s wedding. It looks like she also wore on Saturday the same earrings and necklace that she first wore to Kate’s wedding 7 years ago. However, this is not first time she has re worn them. She was also photographed wearing them last year at Ascot while talking with Kate and other attendees. They are extremely beautiful pieces, but I do not happen to know the designer or brand of them. Thank you again for such an informative post! You must be tired out after all of this. I believe the jewelry is from Robinson Pelham. Kate’s family couldn’t be more graceful and elegant, if they’d been born royal. Although they get criticism from time to time, it is unfounded, because they never speak out of turn, never betray any confidences and are never controversial. I love Carole’s dress sense. Yes, she does wear Catherine Walker frequently, but since the designer and Carole’s style are such a wonderful match…why not? Pippa likewise always looks amazing, without trying to steal the show. It was never Pippa’s intention to draw attention to herself at her sister’s wedding. For me, taking into account the wedding dresses of Kate, Meghan and Pippa, my favourite is Pippa’s. But I did like all three. We are fortunate to be able to share in the joy of these weddings, thanks to Susan’s excellent coverage. I love this style of coat on Kate and I do think it’s a new coat with a primrose yellow flowered hat. The coat still reads cream to me and her dress is white underneath. My guess is that Meghan was just happy to have Kate there since she’d just had a baby a few weeks ago. Kate has a whole closet she could’ve chosen from and she chose something similar to what she’s worn to 3 high profile events. I would think she felt comfortable and that’s what matters. I’m not surprised with the final outcome of the mystery. I was traveling Saturday morning and watched a “rerun” of the wedding on CNN Saturday evening on a television. Kate’s dress definitely looked pale yellow on the screen. As always, Kate looked lovely. Back to say that whether it’s an old or new/ white or yellow dress, the DoC looks classic, elegant, and consciously subdued since th is ceremony is not about her. And for those complaining about the dress, compare her outfit with most of the outfits worn by other ladies at the ceremony ! So many were outrageous and ill-fitting, stridently attempting to call attention to their wearers. The DoC’s hat is much more beautiful and harmonious with her dress, and provides a lovely line from the hemline up to the crown that most others failed to achieve. Most of the female attendees wore conglomerates of mismatched headpieces and clothes, and were tottering on heels which they could not manage gracefully. So, Yeah! for the Duchess! Exactly! I’ve said all along it was a new coat dress in very pale primrose – it was so obvious to me when looking at the photos & details that wasn’t a recycle. The DoC is always right on in her choices. I totally agree with you. Kate has got it all together, ALL the time, even when she’s casually dressed. So, it wasn’t just me who noticed, you hit the nail on the head…so many of the guests wore mismatched headpieces, “tottering on heels which they could not manage gracefully,” Oprah wearing an ill-fitting bustline, etc. Come on ladies, couldn’t you have spent the extra to have a matching headpiece? And, Oprah’s designers, why did you put her in such a dress, you had time to let out the bust, or something! She’s one of my favorite celebs. I have a larger bust and even though I don’t have a lot to spend on clothing, I would not leave the house in a tight-busted dress like that. There is SO much thought, research and advisement that goes into deciding wardrobe for these events. After seeing the official wedding photos that were released today I tend to think that her color choice had a LOT to do with the room that the portraits were going to be taken in and the people that were going to be in the photos. The green walls, white bridesmaids dresses, and bridal gown, HM and Ms. Ragland’s dresses, even the DoCornwall’s dress. It’s all so aesthetically pleasing! Agreed! Seeing that photo really showed how their colours tied together so well with each other, as well as with the green and gold of the room. Would they have all planned that much to coordinate? It’s either amazing planning, or amazing intuition! Amazing planning is my vote! I think the royal family would absolutely go to this extent. Looking back at William and Kate’s official wedding photos I’m still in the same camp. You don’t see anyone wearing fushia or orange which are beautiful spring colors but would clash horribly in that prominently red room. And the same goes for the prominently green room. Nothing is left to chance for this family. Us commoners do it too. I’ve seen so many family portraits where the entire family wears khakis and white collared shirts. Oh those khaki and white shirt photos…I don’t understand why so many people do that. It’s not that difficult to coordinate like colors and patterns (like done here). The khaki and white photos IMHO, need to be retired. Just like a Spring garden bouquet! I keep looking at the photos and am amazed at how young Kate looks. I think the loose hair with out curled ends makes her look so mucher younger than I’ve seen in forever. As much as I think I like her updos I so prefer this more nsteralvtelaxed look. Thanks for the sleuth work. In any event Kate looked just lovely. And I was glad that while she did look great there was the tiniest bit of remaining baby bump whicjh is realistic for less that 4 weeks after giving birth. As always, a fantastic post! What a master of dressing to the occasion Kate has become! It takes confidence and grace to pull off the thoughtful and subtle style she brings to each occasion. I know she has an army of helpers but she’s the one who ultimately has to make it all work for her on what must often be a nasty and unforgiving stage. Thank you so much for your tireless (and tiring!) work on this blog. It’s an absolute joy to read and this reader is eternally grateful. I’m glad the mystery of the coat dress is solved, and on the side of appropriateness! Kate generally puts some thought in her clothes, and especially for an event like this. It turns out she’s wearing something new, non-white, and least distracting. Hopefully, no one can have a problem with that. It was great to see the photo of Rebecca at the wedding! Thanks for sharing that. I noticed Natasha Archer attended as a guest, too. In the live coverage, when the gospel choir was singing during the ceremony, there was an angle that showed the crowd, and she was clearly visible. However, I havent seen any photos anywhere. I hate to even point this out, given how hard you have worked on this…but Charlotte was not christened in 2011 (though I don’t recall the year). To me, 2011 seems like just yesterday, but it’s already 7 years ago! To me, the dress for Charlotte’s christening and the dress for Harry’s wedding fit Kate beautifully. And yet Kate is less than a month out from having her third baby, a baby that sure seemed bigger than before in her pregnancy photos! That made me think she had a new dress, as it seemed there would be an awful lot of tailoring to do on the old one to let it out…if it was even possible to let it out that far. Many, many thanks for your hard work and phenomenal, enjoyable, informative posts! I have to say that I’m not totally convinced that these are two different pieces. I know Kate owns the same item in different colors, but these are too similar to me to warrant owning two versions. I do see the point about the stitching on the back and how those kind of design elements would make an alteration difficult. Wonderful update Susan! Enjoy your week! A very interesting journey for us all! I told my husband yesterday that the world still hadn’t figured out if DoC was wearing a new outfit or the christening outfit. He asked me “how will you cope?”. I told him there are many others who have a much greater interest in DoC than I do, who would have to suffer through it, so if they could survive, then I can too….BUT I’M SO GLAD WE KNOW!!! Let us agree to disagree…..Love your posts and all the hard work and dedication to keep us informed….BUT…. I think it is the same coat. This coat is still cream, still the same fit for a just after post-birth timing in both Charlotte’s and Louis’s birth. This does not look primrose yellow to me, this is cream, as it was before. Her hat has primrose yellow flowers on cream hat. I completely agree with you Joan. Whether or not the coat had a pale yellow tint or not, it is still a cream color. And that means it should have been a non-starter. I believe the protocol guide in the invitation itself specifically stated no cream/white for ladies attending. So as much as I admire Kate, this choice is simply bewildering. @Brittgirl see I don’t even care that it was cream – I was surprised when I first saw it, but not in a “omg Kate just upstaged the bridge” kind of way, more just because that would be a big NO here in the States, but some have said its less important in the UK. Pippa wore white at Kate’s wedding, so I clearly don’t think Kate had any thoughts in her head of “this is too white for a wedding.” I don’t think Kate took anything away from Meghan, I don’t think Meghan thought she was being rude, I don’t think anyone’s day was ruined because of it. And I think Kate looked lovely overall. But if she wanted to avoid attention or controversy, that dress did not accomplish it, lol. Other guests were there in pale yellow and you can clearly see that their outfits looked yellow both in the sunshine and indoors. Sure – I was completely surprised as well, and I am not saying that Kate upstaged the bride in any way. I understand that traditions change and things may be a bit more relaxed on this over in the UK, but I still refer to the protocol guide. Yes, Pippa wore white to Kate’s wedding, and I wasn’t a big fan of that either, but Pippa was a member of the wedding party and that makes things a bit different IMO. Kate was not a member of the wedding party, and I just feel another choice would have been much more appropriate. Kate always shines, no matter what. I am not offended by her choice, just disappointed. Even though it may have a yellow tint, it’s still cream. She could have worn another color and still coordinated beautifully in the official photos. I guess I’m just a traditional girl. Meghan looked exquisite, but I believe her dress should have been off-white or cream, with no veil (though hers was gorgeous). That’s just me – I know it wasn’t my wedding. This wedding was about mixing UK & US traditions however, so I hope my concerns can be seen in that light. Yes, I’m here. Maybe the coat has always been more of a dark cream than we realized, but when outside it looks white. From a purely practical standpoint, do we really think she would have had a custom McQueen made for this wedding that is virtually identical to a dress she already owned and has worn on several significant public occasions, but in an extremely close shade? That’s not the same thing as having two basic Emilia Wickstead dresses in significantly different colors that most people who aren’t big followers of her would not recognize. I think its more likely buttons were added. Re: the fit, if you look at it closely, the front closure seems to pull a bit, which makes sense as she is only 3 weeks PP and not 3 months PP like she was for Charlottes christening. And re: the color – I think its completely reasonable that a cream coat looks yellow in the interior lighting. But you can still see the difference between the flowers on her hat and the dress. I think I am also in the “same coat” camp (or at least I hope it’s the same coat). This coat took on a pinkish tint when paired with pink at Trooping, yellowish with this yellow hat I think it’s just a pure creamy white that can do that. She looks pretty, appropriate, and comfortable for corraling a pistol like Charlotte while being just a few weeks post-partum, and I love the hat! If it IS a new coat, that seems silly to me and sort of a waste. Have a new coat in a new style made in yellow, if that was needed! Or maybe wear that lovely pale pink maternity coat with a new belt? The coats are so similar, I definitely thought they were the same. Charlotte covering her mouth so properly at a young age is just adorable. It was such a joyful occasion to watch Harry get married. Best wishes to the happy couple. Aha! The sleeve buttons. That’s some excellent detective work! Hate to be picky, as I know it’s been a long couple days, but you keep referring to Charlotte being christened in 2011. I’m pretty sure Kate & Will got married in 2011 and Charlotte wasn’t born till 2015.